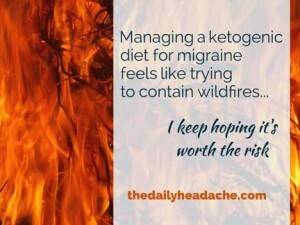 2 Responses to Ketogenic Diet for Migraine: Is it Working? Most supplements I try, even in very small doses, trigger migraine attacks that are unresponsive to medication. You are literally the only person other than me I’ve ever seen with this side effect! I know it’s a terrible thing, but I’m so happy!!! (Sorry, I’m feeling excitable :)) I think it has something to do with how the supplements are made. Lots are made overseas with very little oversight. I have to use pharmaceutical grade supplements, but even then I still have problems. And my last neuro said I was non-compliant, because I have to do a “wash out” period of 2-3 weeks every time I think a new supplement/medication is causing me problems. Thanks so much for writing this blog. I don’t normally comment, but I read every post. I hope your diet helps you, I’ve cut out gluten and it definitely helps. It would be hard to do a keto diet, but maybe it’s worth it. My problem is that I have such a…focus on food. I’m thinking about it, anyway. Thank you for sharing your experience with this diet. Keeping a steady hand on the tiller must be very hard at times, given the mixed results you have experienced, but in the end you will know that you have given this diet a fair shot. Sharing the details of your experience benefits all of us.